STOCKTON - Tim Huddleston has a pair of promising young drivers without a home track, so he is always looking for a good place to race. On Saturday, they stopped at Stockton 99 Speedway at the suggestion of several of their Southern California counterparts. "We were told this was a great place by a lot of people, and it's been fantastic," Huddleston said. "It's a real class operation." 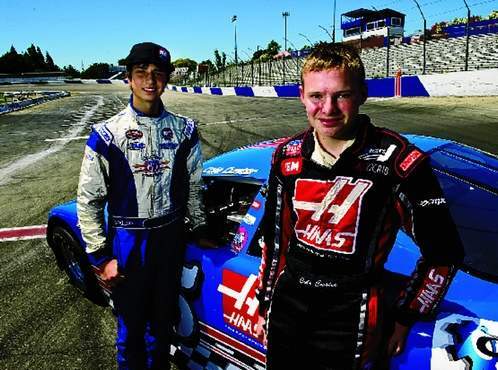 His drivers, 14-year-old Cole Custer and Huddleston's son, 16-year-old Trevor Huddleston, competed in the NASCAR Western Late Model's Firecracker 150. Huddleston's team has the same problem plaguing other racers in the southern part of the state, where there are no longer any NASCAR asphalt tracks after Irwindale Speedway and Orange Show Speedway in San Bernardino closed at the end of last season. There's a good chance Irwindale may reopen by the end of the year and there's a new facility getting close to completion in Bakersfield. But for now, Southern California racers have to travel north to Stockton 99 or All-American Speedway in Roseville, or go to Las Vegas Motor Speedway, where Trevor Huddleston and Custer will race Tuesday. In 1994, there were 19 NASCAR-sanctioned tracks in California. Irwindale will be getting new management, and the Bakersfield facility may be open to run a race in October and a full schedule in 2013. "Now there's just us and Roseville, but it looks like Irwindale and Bakersfield will return pretty soon, and that's great for racing in this state," Stockton 99 co-promoter Tony Noceti said. Stockton 99 has picked up cars from the south for some of its events. In May, a dozen Legends of the Pacific drivers came to Stockton, swelling the division's ranks to 39 cars. The Legends usually draw between 20-25 cars. Huddleston said it was a group of Legends drivers who recommended Stockton 99. "It's nice to hear that people enjoy coming here and pass along the word about us," Stockton 99 co-promoter Carol Noceti said. "Of course, you want other tracks to open up, and they will. But when you have events you are always looking to draw some drivers from out of the area who might be interested, and it's good to get the word out about Stockton 99." Tim Huddleston said his team has visited five tracks this season. Usually he would keep young drivers at one place in a weekly racing program, but moving around can have its benefits. Custer is from Ladera Ranch, in Orange County. His father is Joe Custer, the executive vice president of Tony Stewart's racing organization, Stewart-Haas Racing, and Joe Custer said it's good for the younger drivers to get used to traveling. "As you move up, you have to travel, so in the long run this is going to be very good for us," Cole Custer said. "We're learning about these different tracks, which can only help."